Very Good. Trade paperback (US). Glued binding. 322 p. Contains: Illustrations. Top Secret Restaurant Recipes. In 1996, Americans spent over $100 billion gobbling up meals at full-service American restaurant chains. Wilbur's collection of knock-off recipes for 110 of the most popular of these dishes--absolutely indiscernible from the originals--includes fare from Red Lobster, Pizza Hut, The Olive Garden, Chi-Chi's, and many others. 65 illustrations. Good. Trade paperback (US). Glued binding. 322 p. Contains: Illustrations. 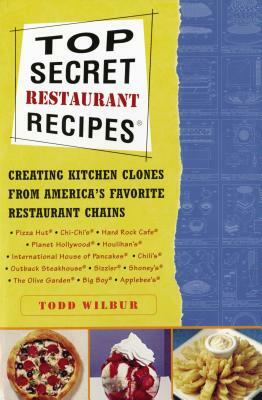 Top Secret Restaurant Recipes. In 1996, Americans spent over $100 billion gobbling up meals at full-service American restaurant chains. Wilbur's collection of knock-off recipes for 110 of the most popular of these dishes--absolutely indiscernible from the originals--includes fare from Red Lobster, Pizza Hut, The Olive Garden, Chi-Chi's, and many others. 65 illustrations.